There have been the craziest heat waves in LA in the past week. We’re talking 110+ degrees outside in some areas and fires breaking out all over the city. Seeing as we don’t have central AC in our kitchen, we thought it was the perfect time to start making more raw recipes. No oven, no stove, no problems! Which brings us to our 10 Minute Raw Gazpacho. I’ve seen other recipes requiring that the tomatoes be blanched and peeled, but the last thing I want to do in this heat is turn the stove on and handle hot tomatoes! All this recipe needs is a sharp knife, a blender, and 10 minutes of your time. We served our 10 Minute Raw Gazpacho in the cutest little striped peppers we found at the farmers market. Talk about fast food! It’s like a raw vegan bread bowl, minus the bread and the nap you’d want to take after eating one. Cut the tops off the bell peppers, then deseed and set aside. Blend the chopped tomato on the lowest speed for 30 seconds, until the tomatoes become a chunky soup. Add the remaining ingredients and blend on low speed for another 30 seconds. Serve the gazpacho in the bell peppers and garnish the soup with red pepper flakes and finely chopped cilantro. 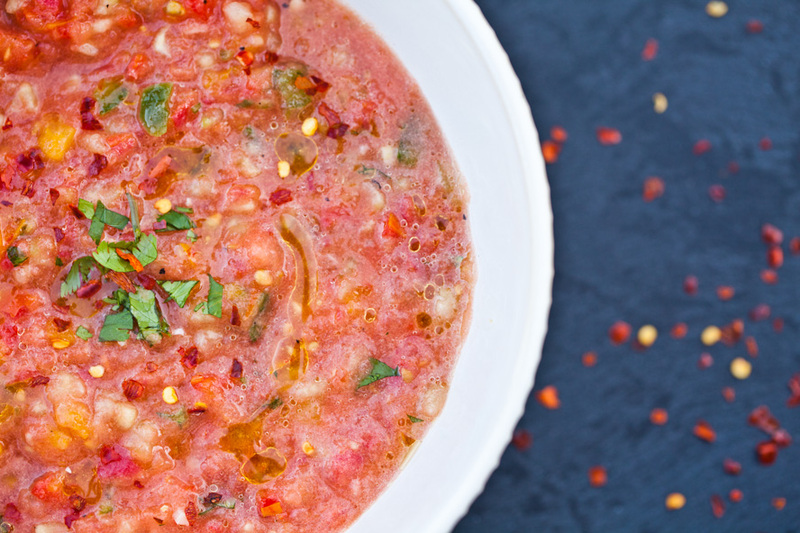 Did you make this 10 Minute Raw Gazpacho? Leave us a comment and tell us all about it! Or post a photo on Instagram with the tag #carrotsandflowers! We can’t wait to see your lovely summer soup! To save this 10 Minute Raw Gazpacho recipe for later, pin the photo below! If you enjoyed our 10 Minute Raw Gazpacho recipe, be sure to check out our Raw Vegan Walnut Tacos or our Purple Raw’n Cauliflower Hummus!